The Handspring Beltclip is a minimalist's case and is effectively a holster for your Visor. When inserted, the entire face of the Visor is protected. The top, bottom, and back of the Visor is completely exposed. 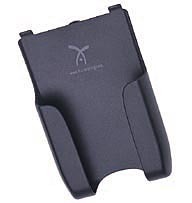 The Handspring logo is visible on the inside of the case and on the beltclip itself. This case is Graphite and mostly plastic, with only part of the beltclip made of metal. This is the first beltclip case that I have seen that allows you to have a non-standard size Springboard module always at your side. I was able to insert and remove the Handspring Modem with ease, even while the Visor was still in the case. The only modules that will have a problem with this case are ones that are completely flush with the Visor as the holster lips over the top of the Visor by a few millimeters. There haven't been any flush Springboard modules yet, so this isn't an issue. Besides, I don't think anyone wants their oversize modules exposed anyway. Being exposed is the major concern for this case. If a case could be considered a suit for the Visor, than the Handspring Beltclip is the jockstrap of cases. Like a jockstrap, it covers the front completely and leaves the back almost completely exposed. Only the sides of the Visor below the Springboard slot is covered to protect from accidental bumps against objects. This protection is for the bottom only. Bump against something with the top of the Visor, and you could be making a repair call for your Visor. The Ir port is exposed, but since the screen is covered, you wouldn't be able to effectively beam anyway. The HotSync port is also exposed, but once again, you can't really use a cable HotSync when you can't see the screen. » Size: 5-3/8" x 3-3/16 x 1¼"